I had hoped to show a photo of the whole section done, but I am working on the pin cube for Autumn. I did not get as much stitched as I had hoped. There was a bit of frogging going on and I was also sleepy a few nights. Hopefully next week I will have more progress. But I do love the colors! 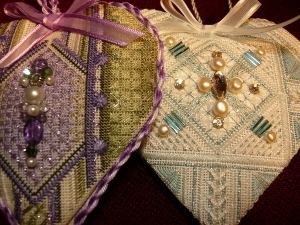 I finally finished these two hearts by Gay Ann Rogers. They are Catherine's Purple Heart and Malachite Heart. Can I start a new heart now? Gaspar was finished a bit ago, but I saved him to show today. One more and I can FFO the set! Heather over at Stitching Lotus hosts this SAL. You are supposed to finish a small piece and post it at the end of the month. I will try to add a link to her log in page when she puts it up! I am sad. My idea for rotations is totally out the window. 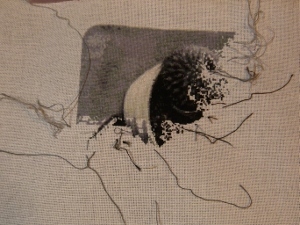 I have not touched Drawn Thread and this piece is taking longer than expected. Hmmm. The best laid plans gone astray. The only good thing is that I love this piece! 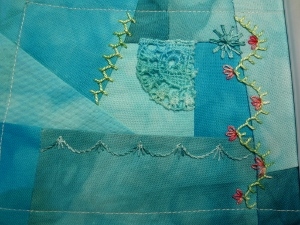 The threads are yummy-Glorianna silks- and although I think the chart stinks, I am enjoying stitching it. I guess I should not say the chart stinks. I am having trouble reading the glossy magazine chart. I tried to copy it, but that did not work. Sharon B is hosting this wonderful challenge where you learn a new stitch a week or if you already know the stitch, work it in a creative way. The information is here . 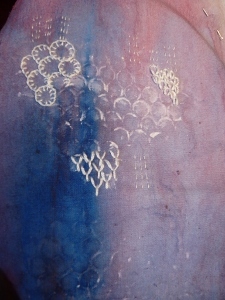 I decided to just do a few stitches on this fabric I dyed and stamped a while ago. The stitch from last week was Fly stitch and then this week was the detached chain. I will keep adding and see what happens. I have almost 20 more posts before I hit my 1000 mark. So I think I will give more information in February as that is when my give-away will be! 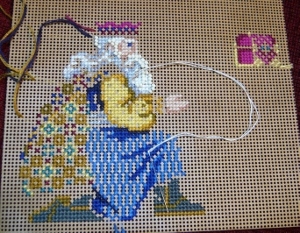 I started my final Wise Man from the Nativity Mill Hill Set. I heard about this project last year when a mixed media artist I follow posted her 100 days of faces. Like a crazy person I thought "I would like to do that!" So here it is, time to start the 100 Day Project Challenge and I joined. Nuts. I must be nuts! The idea is to do something creative for 100 days. You are supposed to challenge yourself and see where you end up creatively. Check it out here if you want to know more. Originally I thought I would do a mixed media challenge but realized I was setting myself up for failure. I am traveling in February and wouldn't take stuff with me. 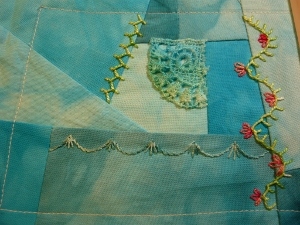 I decided to keep my theme broad-Needlework- and stick to something I do almost every day. But then I wondered, what is the challenge in that? So I stenciled a piece of fabric and thought I would work on it but realized the thought of another new project would drive me over the edge. Not good. Before falling asleep last night I realized I had started a challenge that I needed to work on and that would fit this 100 day project perfectly! The 2020 crazy quilt! So for now, I am working on it for at least 10 minutes every day for 100 days. Anyone else trying to do something for 100 days? My local guild is stitching this piece as a study group. I have already made several mistakes which I am leaving in! I figure I am the only one who will see this piece anyway. Well, except for me posting my mistakes to the world via Facebook and this blog. Here is my ort jar which has thread from December. I will be adding to it each month and just squishing everything down. How about you? Do you have an ort jar? has helped me get some work done on this piece. I know I did 1200 stitches and I see some progress. I may actually get this done in the next century! 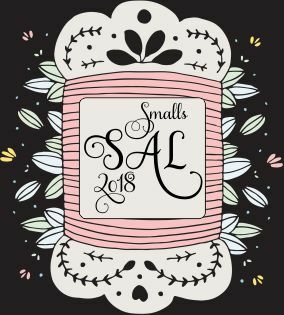 Jo over at Serendipitous Stitching has a wonderful SAL that is called Gifted Gorgeousness. I decided that since my Magi are bringing gifts to the Christ child, they will count for this stitch a long.Ha! 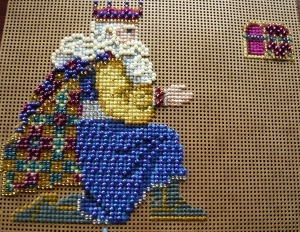 There is also a Facebook page for Mill Hill bead kits.....And you know I love Mill Hill Bead Kits! And this is Gaspar right now. I was going to post this yesterday, but I forgot. 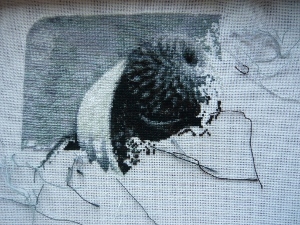 I am trying to get those 1200 stitches in this piece before the end of the month but it is harder than it looks. I am at around 600. When I get them all in, I will post a photo of where I started at the beginning of the month along with where I ended up. It is nice just to work on one big piece and concentrate on it. 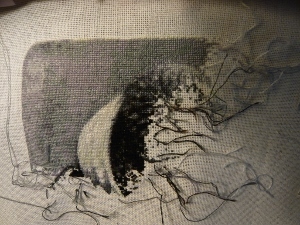 Hopefully I will get some serious work on Drawn Thread Sampler done this month too. I did not have time to post my stitching from last week but am including it in this week. TAST is the brain child of Sharon B over at Pintangle. She does a much better job explaining but this is a stitching challenge to learn new stitches every Tuesday and then post them on the web somewhere(your choice!) 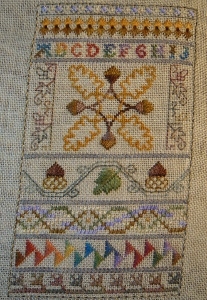 The first stitches have been very basic, but are good ones to know. I decided to do a free form stitching project and just DO IT! I have looked at this challenge for years and get frustrated when I try to do a stitch on a project and it doesn't work and I have to rip it out. This way, I will just do the stitch and let it be. 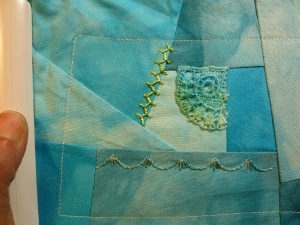 The two stitches are running stitch and buttonhole stitch. 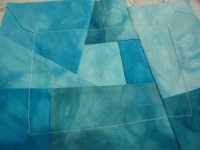 I am using a long piece of fabric that is fairly narrow that I dyed and then painted. Not too exciting, but it is a start. I have joined a Facebook group for stitching Mill Hill Bead Kits. 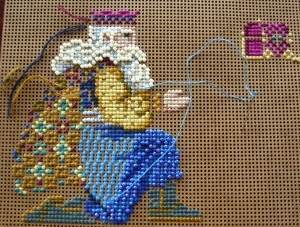 Since I have quite a few and am generally stitching a least one, it seemed like a good fit. Thanks jhm for letting me know about it! I was able to get a little more beading done. Hopefully by next Monday he will have quite a bit more done. 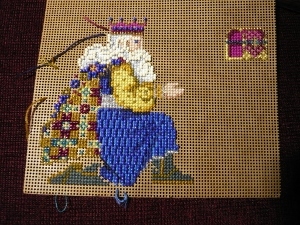 As you can see, I am to the beading on Gaspar. This means he is my evening stitching project at home. I will pull the other Magi for traveling once I get Gaspar done. 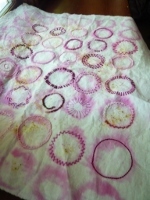 I think I will combine my samples for my class with TAST by Sharon B and have it as my travel project. Tall Year Square will have to be squeezed in at some point soon. I have to have some basting done by January 17th. Basting, yuck! I will post any progress on this craziness soon. How are your 2018 stitching plans going? 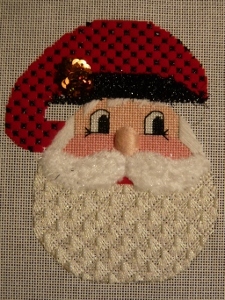 First, I was able to finish Pine Cone Santa last night! Now to finish him into an ornament! I have some hearts I need to do too, so hopefully they will all get done in January. Rotations:I go a little crazy if I have too much started, so I plan on working on a big project at a time. Right now Reptiles is up so I can get 1200 stitches in this month. Once I get that many stitches in, I will concentrate on Drawn Thread Sampler. I always keep a small travel piece, normally a Mill Hill, and one small to medium piece to stitch in the evening. Here is the issue:I want to get those Magi done and ready to hang in 2018. I must work on Tall Year Squared and samples for a class I am teaching. How to get it all in? Hmmm. I will need to think about it some more. Well, I caught a variety of the bug on New Year's Eve. Crashed at 7:30 pm and got up 12 hours later. I started feeling better yesterday and I think I am much better today. Did not let anyone in my family attend church as I did not want to share anything or bring anything new home! And it was cold out anyway! For the past few years I have joined the crazies on Facebook-you know who you are!-who stitch a new project(or some project they want to get done) every day in January. Not this year. I have some large projects I want to do some concentrated stitching on and get them DONE! 1. 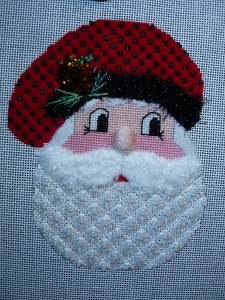 Pine Cone Santa-Janet Zickler Casey-He is so close to being stitched! I just need to get his hat done and add some pine needles. 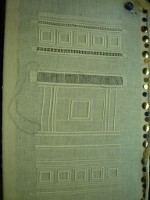 This is close to being done, but I am waiting to finish it along with the large sampler. 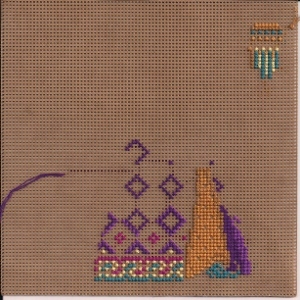 3.Drawn Thread Sampler-GAR-I think I am further along than this, but can't find my photo. Once the boys head back to college and the Christmas stuff is down, this is coming upstairs! 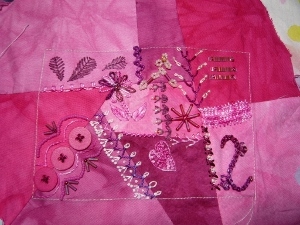 This is a challenge run by Sharon B to get us to use our crazy quilt stash. And boy, do I have a stash! 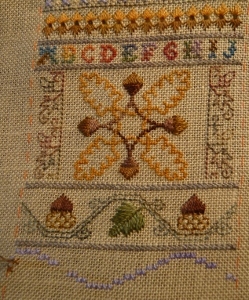 This is another challenge by Sharon B. trying to push us to try new stitches. I need to find a piece of fabric and start! 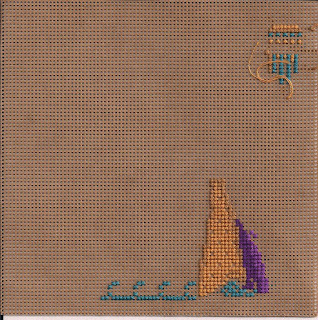 7.Gaspar-Mill Hill Bead Kit-I have a progress report to show later this week. 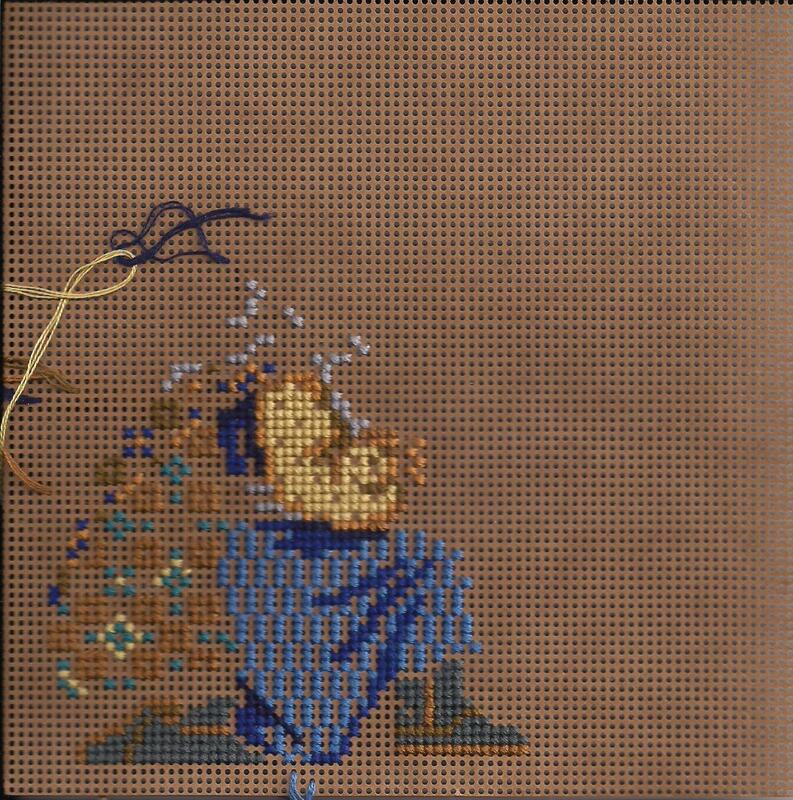 8.Balthasar-Mill Hill Bead Kit-Not even started yet! 9. First Christmas Stocking-I would love to have this hanging for 2018. 10.Tall Year Squared-Betsy Morgan-I can't find my image, but I am stitching this with my local EGA and need to get my fabric prepared. Will post a photo when I do. I have wanted to do one of these for a while. Hopefully I will keep up weekly. I really haven't told you about my rotations or my stitching Christmas presents. I will bore you with that another day. And maybe the first finish of the year!